Noel Kelly's Kids - VALE Bob McGuinness Bob was a hard man to tackle as shown in this 1966 photo. Former Wests Magpies centre, Bob McGuiness passed away recently, aged 71. Bob played 92 first grade matches with Wests in his seven seasons from 1962. He played in the famous 1963 Grand Final, when an after match photo of the mud-covered rival captains, was used as the model for the Provan-SummonsPremiership trophy. 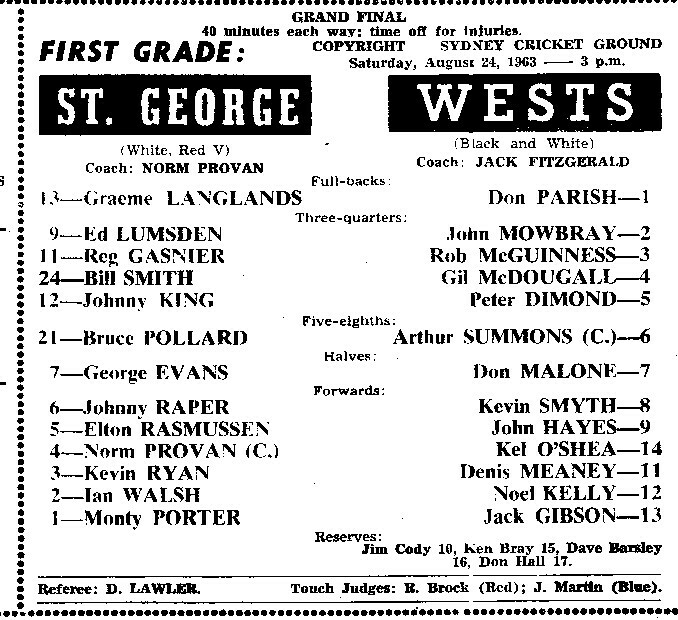 St. George won the 1963 Grand Final, beating Wests 8-3.ob's team-mates in the Wests side for that match included Jack Gibson, Noel Kelly, Kel O'Shea, Peter Dimond and captain Arthur Summons, while his opposing centre was Immortal and Team of the Century member, Reg Gasnier. Two great teams in the famous 1963 Grand Final. Anzac Day eve April 1968 Lidcombe Oval. After leaving Wests, Bob played and coached on the South Coast, with Port Kembla and Gerringong two of the clubs for whom he played. In 1972, he captain-coached Gerringong to the South Coast first grade Premiership. An Industrial Arts High School teacher, Bob became involved with the Australian Schools Rugby League team and in 1981 managed the side, while in 1982, he coached the team on their New Zealand tour. Among the many good players in the Australian schools team during Bob's involvement were Andrew Ettingshausen, Ben Elias, Ricky Walford, Scott Gale and Paul Langmack. A local Wests junior, Bob grew up in Homebush and played junior football in the area before moving to grade as an 18 year old. Bob was also a very handy kicker as this newspaper story from '67 recalls. After his retirement he moved to the Tweed Heads area in 2000. Bob suffered renal failure and his funeral was at Chinderah on 28 April. He is survived by his daughter Michelle, son-in-law Mick and grandchildren. ﻿2014. Bob was a hard man to tackle as shown in this 1966 photo. Former Wests Magpies centre, Bob McGuiness passed away recently, aged 71. Bob played 92 first grade matches with Wests in his seven seasons from 1962. 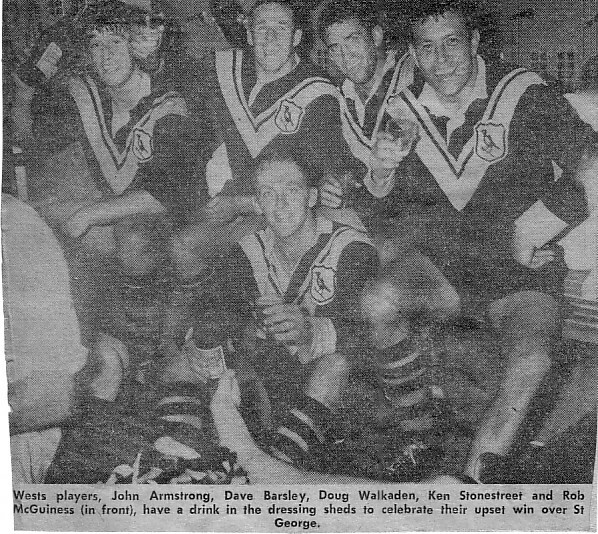 He played in the famous 1963 Grand Final, when an after match photo of the mud-covered rival captains, was used as the model for the Provan-SummonsPremiership trophy. St. George won the 1963 Grand Final, beating Wests 8-3.ob's team-mates in the Wests side for that match included Jack Gibson, Noel Kelly, Kel O'Shea, Peter Dimond and captain Arthur Summons, while his opposing centre was Immortal and Team of the Century member, Reg Gasnier. Two great teams in the famous 1963 Grand Final. Anzac Day eve April 1968 Lidcombe Oval. After leaving Wests, Bob played and coached on the South Coast, with Port Kembla and Gerringong two of the clubs for whom he played. In 1972, he captain-coached Gerringong to the South Coast first grade Premiership. An Industrial Arts High School teacher, Bob became involved with the Australian Schools Rugby League team and in 1981 managed the side, while in 1982, he coached the team on their New Zealand tour. Among the many good players in the Australian schools team during Bob's involvement were Andrew Ettingshausen, Ben Elias, Ricky Walford, Scott Gale and Paul Langmack. A local Wests junior, Bob grew up in Homebush and played junior football in the area before moving to grade as an 18 year old. Bob was also a very handy kicker as this newspaper story from '67 recalls. After his retirement he moved to the Tweed Heads area in 2000. Bob suffered renal failure and his funeral was at Chinderah on 28 April. He is survived by his daughter Michelle, son-in-law Mick and grandchildren. ﻿2014.